What artist do you consider as having the greatest influence on your work? Before I get into comments on specific artists who have had a prolonged effect on me, I just wanted to say that I have always been inspired by the work that I see when I visit the West End Gallery. I always come away with my batteries charged! I’m reminded of the response by Edward Hopper when asked this question! He said,” Me!” I thought, boy, is he arrogant! But as I thought about it, that really needs to be our answer in a way. I think we, as artists, need to be independently doing our own thing. We need to look inside ourselves and paint from our own hearts. But, I also think that art is not done in a vacuum. There are two artists that I find myself refering back to often for advice from their paintings- An English “wildlife and train-scene” painter, David Shepherd (shown above) and an American “calendar painter,” Paul Detlefsen (shown to the right). 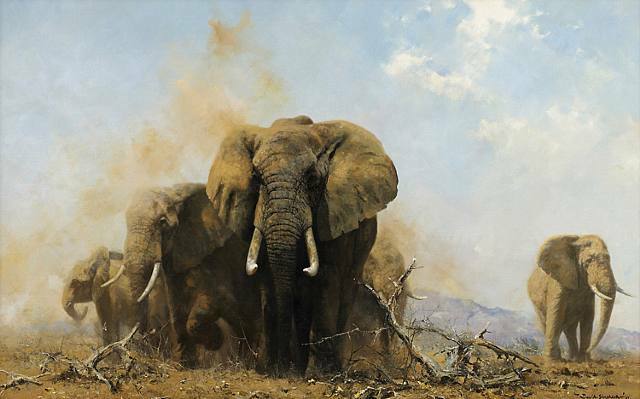 From David Shepherd, I get advice on scope, on composition, on colors, on paint texture and atmosphere. And from Paul Detlefsen, I get nostalgia, atmosphere, colors, and quietly stated detail. And actually from Edward Hopper, I think I try to emulate to some degree his lifestyle as an artist. He quietly went about his day working and thinking about his painting. He was able to build his life around one of creativity and was able to hold off many of the distractions of our modern world. Although there are tons of artists that I like and admire, both past and present, these three are ones that seem to have kept a profound presence with me over the years. When did you start painting or drawing or doing whatever it is that makes up your work? In kindergarten I drew a horse I was pretty happy with, and in a snap decision determined I wanted to be an artist. I’m pretty sure I told my parents, because my dad started bringing home stacks of scrap paper from his office for me to practice on. My parents both were very creative and liked to make things, so soon I was painting scenes on rocks and jam jar lids and little plaques. In middle school I set off to numerous local arts and crafts shows with my little booth full of stuff I had made to sell, and was pleasantly surprised when people bought things. In high school I had my first experience with oils. I put so much paint on my canvas (an airborne ballerina) that the whole thing started to sag, and I had to restretch the canvas. We were lucky to have a very good teacher in the high school, and he was very encouraging. When I got to college to start my art major, I found that while we were being taught to draw well, nobody was much interested in teaching representational painting techniques. We were handed a materials list, taught to make our own canvases, and shoved out to sea in a leaky boat. Oils didn’t take to me nor I to them, but I loved watercolors, where some actual teaching was going on. After graduation and between jobs I decided to give oils another chance and set out to teach myself by doing still lifes. This approach sort of worked, and then I learned a lot more in graduate school, where I earned a master’s in illustration. Lots of great hours spent doing sample covers for romance novels in oils under the tutelage of Murray Tinkleman. 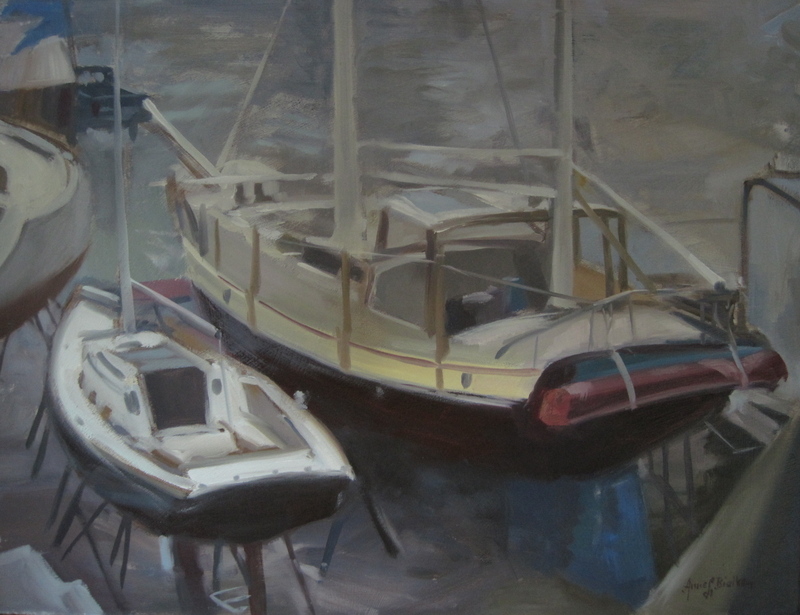 Later I had the benefit of some good teaching from Tom Buechner and Marty Poole, and I went to some Plein Air Painters of America workshops to rub shoulders with other artists and fire up the engine. What artist or artists do you consider as having the greatest influence on your work? When I started painting seriously, I really studied the American impressionists. Of course I love Sargent–everyone does–but my personal favorites and the ones I feel have had the biggest influence on my artistic thinking are Willard Metcalf, Dennis Miller Bunker, Thomas Wilmer Dewing, and the group that painted interiors with figures like Edmund Tarbell. Contemporary influences would be Richard Schmid, Tom Hughes, and Patricia Moran for her wonderful tips on painting flowers, which I love to do. Do you have any influences, artistic or otherwise, that might surprise those familiar with your work? It may come as no surprise, but I do a lot of theatrical scenic painting, which I think influences how I think about contrast and value. What was the best advice you ever received that has helped you with your art? The quote I remember best came during a workshop with Marty Poole. I was working on a painting in which I had allowed some far distant shapes to get too big, so instead of staying in the far distance where they belonged, they had crept up into the middle ground and were destroying the sense of scale my landscape needed. As I recall I was whining about it to Marty and he looked at me with wide eyes and said “Fight for them!” That was very sound advice. It is too easy to let a picture get out of control and give up on your idea or original intent, following the path of least resistance. But much more laudable to fight the good fight and lose, if you are going to lose, honorably—-or better yet, win! If you could only pass along one piece of advice to a young artist, what would that be? I guess I would say to paint what excites YOU, not what other people in your life think you should be painting. We all get so much well-meaning advice. I still (and likely will always) struggle with WHAT KIND of an artist I would like to be. There are so many paths that could be followed–so many choices, so many techniques, so many possibilities for subject matter. If you are versatile and curious, you will go through many phases in your artistic life. Don’t let other people’s opinions about what YOU SHOULD be painting distract you. Do you have a favorite piece of art by someone other than yourself? How about by you? 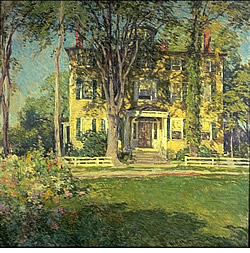 If I could own any piece of art in the world, I would choose Willard Metcalf’s “Captain Lord House, Kennebunkport, Maine”. In my opinion it sums up enjoyment of paint, pattern and brushwork for its own sake, captures a moment in American history and architecture that really resonates with me, and is a perfect composition. In more realistic terms, I actually own several pieces by other artists of which I am very fond, from watercolors to oils to etchings. 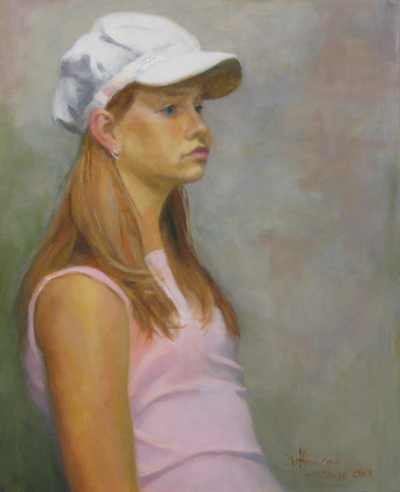 My favorite paintings of my own are all of my daughters at various stages of their childhood. In a couple of instances, I felt my ability actually coincided with my intent–a most satisfying experience, and unfortunately all too rare. Do you listen to music when you work? If so, could you share a few titles or artists? When I work, I do listen to music; NPR and, if I am not thinking too hard, books on tape. Some paintings I need quiet for, especially if there are lots of complicated problems to be solved. My favorite cd is the self-titled “Renee Fleming”, which has been played over and over again as I paint. I love bold sweeping melodies like Tchaikovsky and Puccini produced, and I’m very partial to hearing Debussy played on the piano below my studio by my daughter Audrey. I’m also pretty fond of choral music. But sometimes I listen to something lighter like Al Jareau or Steely Dan. Or whatever “Performance Today” on NPR is featuring. I have many favorite books, but in adulthood I find myself on a more or less steady diet of mysteries and international espionage/intrigue, enlivened by the occasional biography or novel with literary merit (usually at my daughters’ urging, who are more omnivorous and intellectual in their reading choices). Last week I finally read “The Shipping News” and was delighted by it. And I keep old and new poetry by the bedside. 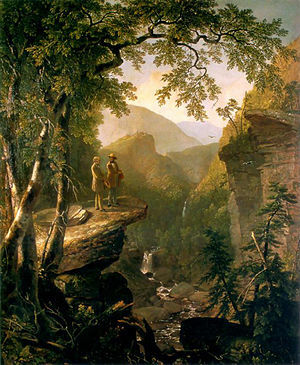 Asher Durand painted “Kindred Spirits” as a tribute to Thomas Cole upon his death. It depicts and emphasizes the caring　bond　between Thomas Cole and his friend, the poet, William Cullen Bryant, in the Catskill Mountains. “Kindred Spirits” evokes in me the respect of one artist’s feelings for another. Tom Buechner’s talent and leadership　will be missed and can never be replaced. When I first came to work with Tom Buechner in the summer of 2008 as his studio assistant, I had painted less than ten representational pictures during my short time as a painter. My primary focus (and consequently the focus of my senior exhibition at Houghton College) was on abstract works consisting of heavily layered stripes, whose muted grey colors originated from the Western New York landscape I had grown up in. It was both an exhilarating and daunting prospect coming to work with such a renowned master of figurative painting and staunch realist. Though I was certainly much farther behind in technical knowledge and abilities than my predecessors had been, it allowed me to give myself over to Tom’s direction completely, having little or no bad habits to break. I told Tom from the outset, “Please direct me in every step of this, as I have no idea what I’m doing”. 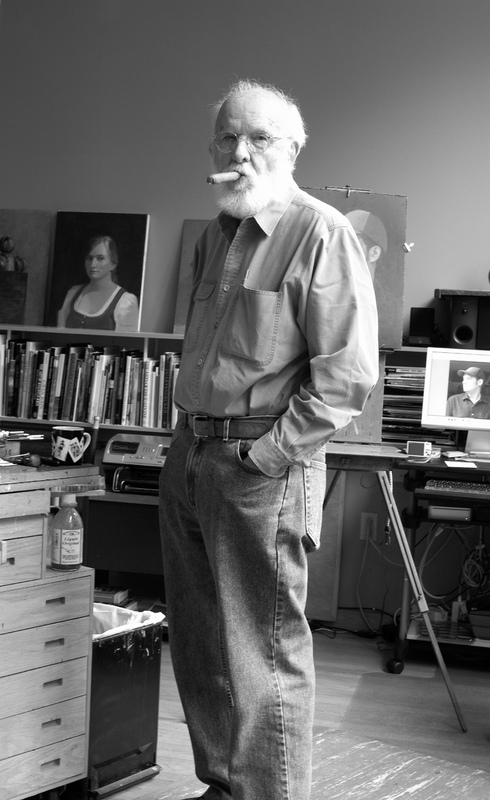 Tom obliged, and steadily began building in me a solid foundation of technical and theoretical approaches to painting. I began to maintain two separate ‘modes’ of painting; the first being my realistic works (primarily still lifes and portraits) done exclusively with Tom, and second, the continuation of my abstract work done in my home studio. As I worked for and painted with Tom on a weekly basis, I began noticing distinct lessons and techniques which I was learning from Tom, creeping into my abstract work. 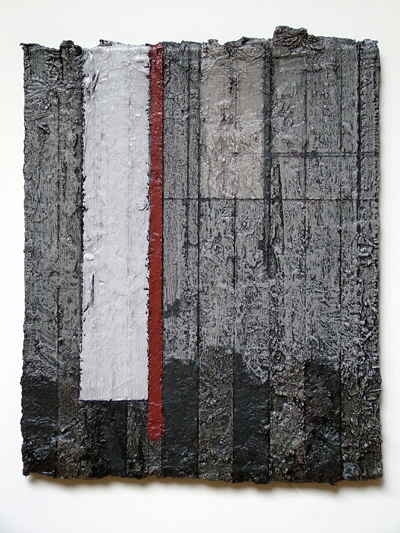 Prior to Tom’s influence, my work had relied mostly on thin, transparent layers of paint, confined to strict rectilinear spaces. I soon found myself applying copious amounts of paint to the canvas in heavy impasto; an extreme extension of the thick, deft strokes I had come to admire in Tom’s looser works and those he had done in throughout the 1960’s and 70’s. 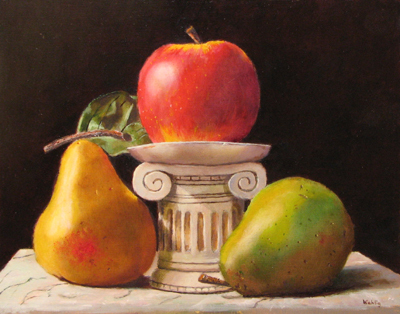 While painting still lifes with Tom, I learned two simple yet effective techniques which drastically altered my approach to my abstract work. The first, glazing in black, was the result of a discussion Tom and I had on the approaches of the old masters (specifically Spanish) and the need to create tonal richness and unity within a picture. The results of this technique on a simple still life of ceramic and glass bottles were so exciting that I began to glaze everything in my home studio, sometimes applying as many as nine or ten layers. This ‘discovery’ led to countless new ideas and directions within my abstract work. The second significant technique Tom taught me was the use of pure color over white to achieve the brightest and most luminous colors possible. This approach was ultimately part of a much larger process of thinking he stressed every time I started a new picture, and that was to nail down the BIG ideas first and worry about specifics later. Colors I had previously muted by adding raw umber in the paint were now muted by glazing over the paint, resulting in richer colors and more compelling pictures. For Tom, living and painting traditionally in New York City during the rise and reign of modernism/abstract expressionism, taking a guarded and often unimpressed view of non-representational painting was certainly natural and understandable. On one occasion, after I suggested that it would be interesting to see a Rubens and a de Kooning hung next to each other, Tom looked at me as if I’d just smashed the Ten Commandments. I felt it my duty as a practitioner of abstract painting to expose him to my own work which I felt had enough ‘painterly’ qualities to appeal to his sensibilities. After having seen a number of my non-representational paintings, Tom encouraged me to try and bring some of my abstract strengths (surface texture, spontaneity, composition) into the realistic work I was doing with him. While this was (and is) a difficult task, I began to become acutely aware of the interconnectedness between these two ‘styles’ of painting I would otherwise have thought and kept completely separate. Though he would never have wanted to take credit for it, there is no doubt in my mind that my painting, both representational and abstract, has improved exponentially since painting with Tom. I feel overwhelmingly blessed to have been a part of Tom’s wisest years, and the recipient of his immense knowledge and gracious friendship. As a kid, I had horses at home, and my sister and I and the neighborhood girls who also had horses would throw ourselves on them and roam the countryside of northern Minnesota. We trotted and cantered the gravel roads, me usually bringing up the rear on my small Shetland pony (who had to be about 30 years old) while the other girls on their larger beasts forged ahead through fields and ditches. We had a great time. Later, as a suburbanite with young children, I used to bum rides with friends on other people’s horses, and trail ride the hills around Ithaca. It was good camaraderie and a way to get outside. But I reached a point in early middle age when suddenly I really wanted horses of my own. At my urging, my husband and I bought a 130-acre farm. To be fair, it wasn’t just so that we could have horses, but that was a perquisite. Horses came along when we had the infrastructure set up, nothing too special, just backyard animals without much breeding or training, but fine for what we wanted—which was to just ride around on our property. No goals, low expectations. A few years ago, I started taking lessons from my astonishingly expert next-door neighbor, and all of a sudden, my eyes were opened. She has lived a life rich with experiences and connections with everything from Pony Club to dressage, three-day eventing to driving. Through her influence, I started to attend sporting horse events, very different from the shows I had attended previously. I was getting a look at the horse world through the eyes of someone who really knew it, and did it ever look great! Colors, lines, action, beauty! What a wonderful thing to paint! When I was little, I read all the Black Stallion books by Walter Farley, which had great illustrations in crisp black and white of slim-legged Thoroughbreds. In contrast, C.W. Anderson’s beautiful graphite/charcoal drawings had tremendous detail (all that thin skin and blood vessels!) and a sense of stillness, even when the horses were running. 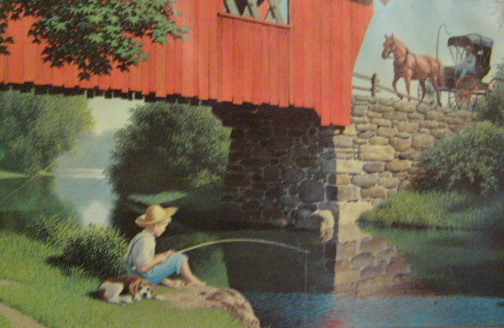 Then there was Wesley Dennis, who illustrated Marguerite Henry’s horse books in color. His animals had tremendous character. I spent a lot of happy time examining the drawings and drawing horses myself. 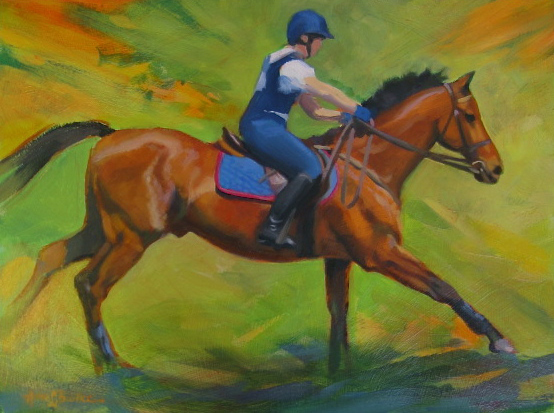 So when in the last couple of years I started thinking about how much fun it would be to paint horses in oil, I felt I had come by the interest honestly. This past fall, as part of the new chapter in my life that includes far more painting on a daily basis (this is my triplet daughters’ sophomore year of college, and both they and I have passed through the inevitable year of transition) I have started focusing on learning to paint horses. They are a difficult subject. Their anatomy is challenging. A skeleton in headlong action, covered with muscles and blood vessels just under a thin multi-hued haircoat, is a subject to be reckoned with. There is the difficulty of trying to suggest detail in such a way that the structure is believable, without sucking the life from the picture by trying to capture every tiny value change. 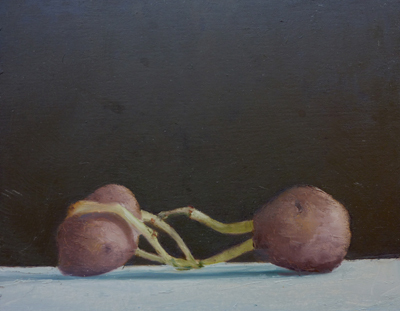 I have set myself the task of doing studies, trying not to think of them as finished pictures unless I want to. 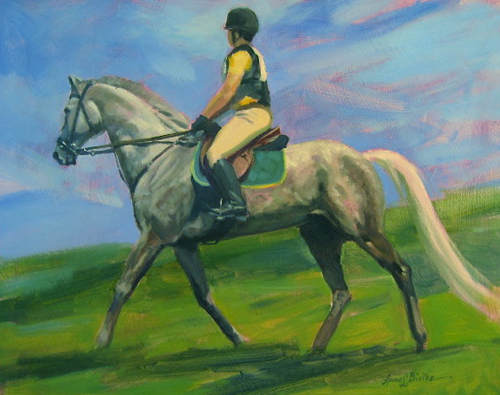 One of the unfinished paintings in the studio is a foxhunting picture with horses AND hounds. Talk about an exercise in humility. It’s going to take some time. Tackling a new subject, with maybe a commensurate change in technique, is tough– sort of like plunging, in middle age, into horsekeeping with all its responsibilities and unknowns. The more you know about horses, the more you realize you DON’T know. Art is much the same. There is always something new to learn, and experimentation and pushing your boundaries is what keeps things interesting. This past fall the gallery hosted a tribute to the late Tom Buechner, who passed away earlier in the year. The exhibit featured work from many of his students and painting companions, each of who provided a short essay about their time spent with Tom. We are trying to run the entire series of essays here on this blog and will continue until the end of this year. Today we feature Kathryn Cummings. Tom was eager to share his enthusiasm for art as a subject or the technique or any aspect of the painting with anyone who responded with interest or with respect. Tom enjoyed story telling, too. One night he pondered why the 4th　grade boys, who drew thank you images for their recent field trip to his studio, portrayed him as they did. He guided me to the kitchen. On the refrigerator door was a contour drawing of a couch with a gentleman in a reclined position dressed in a sleeveless undershirt, boxers, and socks with garters. There was a panel onto which the man was painting or drawing. Tom’s response was that he just did not understand why those little boys were fascinated to portray Tom in just his underwear! Well, if you were fully dressed for the studio tour, Tom, I guess those little boys were being creative and imaginative. From the viewpoint of the high school art teacher, the field trip should open the possibilities for both the future art student and for the future everyday art appreciator. I found a fellow advocate in Tom and, between the two of us, we were able to give the students not just a day (a whole day!) away from school, but an educational experience. There were field trips to the Arnot Art Museum where Tom had work displayed. He discussed it, then we all went to his Studio in Corning by school bus, of course. As a featured artist at West End Gallery, he discussed the painting process at the “Gallery Talk”, we again visited his studio. We also visited 171 Cedar Arts Center. Once a year, the students were introduced to how to enter an art museum, gallery or studio expectantly, appropriately, and appreciatively. The very fact that they learned the addresses and the locations of those places was a starting point. Because I had been painting with Tom and Marty, I applied their technical points and palette choices, which expanded the students’ base line of experiences. Because I needed remedial painting experiences, I had my students draw the subject from life, then paint a griselle or an underpainting, and then apply local color, scumble and glaze. West End Gallery talks, a drawing and painting student named Amos asked the question that every student, every adult, and everyone who has ever painted have asked. It was, and I quote, “How do you know when a painting is done?” Tom answered the question as if it had never been asked before. “That is a very interesting question and I will try to answer it!” I told Tom later that one boy’s response to his Dad’s question of what he thought about Tom’s portraits was “Dad, there was a portrait of a suited business man that I swear if, I stuck out my hand, he would have responded by sticking out his hand and we would have shook hands!” Tom’s response was something like yes, ‘but that was not the intent of the painting’. He elaborated, and his dissertation was similar, the answer to that UNIVERSAL QUESTION. In 1988, when I started to paint on Friday nights with Tom and Marty, I was introduced to ‘new-to-me’ techniques and approaches. Eventually, I passed on what had become pivotal information to my students. The gazillion techniques that describe how to evaluate someone’s legacy are printed in an overabundance of books. None of us are isolated. Tom impacted unknown or nameless people in positive ways because he enjoyed his life so much. He was willing to share within a structure that allowed him time to paint. Because I was able to co-ordinate those magical field trips with installations of Tom’s work and his invitations to tromp through his house and studio, my students were touched. Whether they became hobbyist or career artists, former Williamson High students know that art studios are not a mythical place. Many students left the talks and tours with the intent to do better, knowing that there could be a place for them at the table of art. The　immediacy　of the paintings　was　inspiring. They appreciated what they saw and heard. The students were awed and giddy based on　what they had experienced and for what they imagined about their　future prospects.